What to Eat - Which One is a Healthy Diet for Me? What to Eat: Cleansing Diet vs What Is a Healthy Diet for Me? We firmly believe that to cleanse the body for healing, eating a mostly raw vegetable and fruit diet can't be beat. When you are feeling the effects of chronic ill health from a modern diet, overloaded with empty calories, chemicals and toxic substances - it is what you leave OUT of your diet that makes the difference. 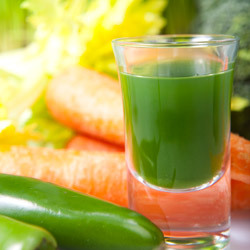 We recommend a diet of green juices and fresh fruits and vegetables when doing a full cleanse for excellent results - during intestinal, kidney and liver cleansing. The best and most thorough cleansing means not continuing to put in what you are trying to get rid of. Customers using our cleanses are encouraged to juice, eat salads, raw fruits and vegetables to facilitate the cleanse. A healthier diet after cleansing would be sure to include plenty of fresh nutrient-dense organic fruits, vegetables, raw nuts and seeds. You've heard this before. We love fresh greens juices and used to make these 3 times a week for local customers using at least 8 types of fresh greens. Our secret ingredient: we added a tablespoon of our superfood green powder, Vital Nutrition Plus (spirulina, chlorella, beets, barley grass, rose hips, etc).You can use it too. We really want you to help you be healthy! It also comes in convenient capsules. It is what you leave OUT of your diet that makes the difference. Low-Carb Dieters leave out sugars, white flour and many processed foods which are loaded with synthetic "nutrients". Much better! But what is the quality of the animal foods they eat - factory-farmed and sick? The cheapest and most easily available foods are from antibiotic- and hormone-laden animals, consuming very questionable genetically-modified feeds or feeds containing other animal parts & feathers. Or grass-fed and raised humanely which is much healthier? Vegans leave out all the unhealthy animal foods loaded with the hormones, antibiotics and disease-ridden "cruelty feeds" (ground up parts from sick animals or the feathers and skins, etc. or just unnatural foods for that animal which make them sick). They avoid all meat from cows, chickens, or even fish raised in overcrowded, industrialized factory-farms. Ethical choices and important for health … but what about the empty, processed or genetically altered soy, corn and wheat products that are often used to substitute for animal foods? Vegetarians of various types leave out some industrially-raised and processed animal foods - maybe eating fish or eggs instead meats. Safer, but how are toxic-free are the eggs (from sick chickens?) and fish (mercury and factory fish-farm chemicals). And seed oils (corn, soy, canola, safflower, sunflower) ALL have mega-transfats from their processing, no matter what the label says. Extra-virgin, unadulterated olive and coconut oils are best to eat, but harder to find them pure and those are expensive. And again, vegetarians often eat genetically-modified soy products and canola oil, and also corn and grain products which are processed and empty of vital factors, or spray-extruded (like chips and shaped cereals) and toxic. Health is still a problem. Eating organically-grown foods avoids many chemical toxins found in practically everything grown in American or imported by multi-national corporations. But many items sold in health food stores that claim organic ingredients, also have excess 'organic' sugars or fake sweeteners, genetically modified foods and oils (canola), not to mention extruded grain products saturated with transfats, or other processing. Regular grocery stores now arry organic white sugar - anyone falling for that? Raw Vegan eaters leave out almost everything bad, and many good things too. When leaders of the raw vegan community called for blood test a few years ago to prove their "superior health" - oops, they were deficient! Long term, hard-to-find healthy animal fats provide necessary nutrients that can't be found in plants-only diets. Great cleansing diet, but still missing the mark for true health. Since Homo sapiens has lived in so many climates and locales and is able to adapt to whatever is available to eat there, it seems that paying attention to how the foods are raised, stored and prepared has a greater impact on health overall, than adhering to a specific diet. This includes how food is grown or raised - in an unnatural way on depleted, chemicalized soil, or sick animals fed other animals instead of their natural vegetable diet. No wonder everyone is getting sicker and fatter! Starved for real nutrition, people feel the urge to eat more and more with disasterous results - obesity, diabetes, heart disease, cancer! And they can try special diets, but are still without a proper solution because of the quality of our food supply! We in the United States are at a particular disadvantage, because our food supply seems to be the most adulerated, unnaturally raised and processed of any. There are countries that have done better. ... If you want to laugh instead, read these in-jokes about health diets. We would like to educate you about choosing your food. See Recommendations for a Healthy Diet During or After Cleansing and to Help Eliminate Constipation.